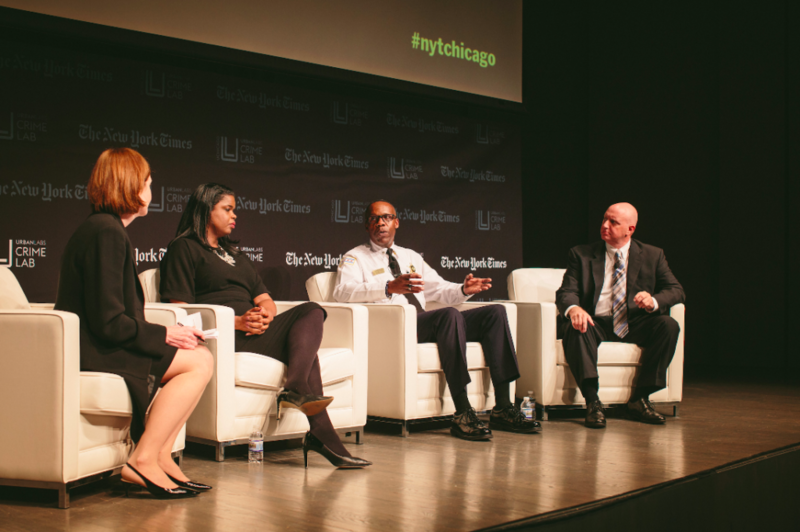 Last week the New York Times came to Chicago to host a two-hour conversation about the city’s gun violence crisis. The event, “Chicago at a Crossroads,” was announced as an attempt to “work to turn the tide of violence” by “exploring realistic, promising strategies” and starting “provocative discussions.” It was produced in collaboration with the University of Chicago Crime Lab, which works with the Chicago Police Department to study patterns in the city’s violence though data analysis, and sponsored by, among other entities, Chase Bank. “Too many people are dying in Chicago. Let’s change that,” John Eligon, one of the Times reporters who hosted the conversation, wrote on Twitter in advance of the event. This was not the first stanza in the Times’s intervention on the subject of Chicago violence. Almost a year ago, the paper sent a team of journalists to Chicago to cover every shooting that took place during what turned out to be a historically violent Memorial Day weekend. The heavily promoted reporting project led to a multimedia feature, “A Weekend in Chicago,” and a series of subsequent stories that followed up on the aftermath and impact of particular shootings. The goal of this coverage, the paper said, was to “help people better understand why this violence is occurring and what needs to happen to end it;” implicit in that statement and in the marketing for the package was a judgment passed against the violence coverage produced by Chicago’s two daily newspapers, the Tribune and the Sun-Times. But the Times did not tell the story of Chicago’s violence in an innovative or unprecedented way; indeed, its coverage of this violence fell short in the same way that local coverage has fallen short for years. “A Weekend in Chicago,” in profiling every shooting that occurred over Memorial Day weekend, adopted the same logic of saturation that many Chicago publications have long followed in covering violence. The thinking behind this kind of coverage is that the best way to understand this far-reaching crisis is to leave no story untold, to track each and every shooting and murder as it happens. As former Weekly editor-in-chief Bea Malsky wrote two years ago, the news website DNAinfo Chicago sought to raise the bar for this blanket kind of violence coverage when it launched in 2012: the website trumpeted its in-person coverage of every city homicide as the new standard for crime reporting. It created a timeline and map (which it still updates) cataloging every shooting since 2010, and its reporters visited every crime scene they could and wrote daily stories about violence in various neighborhoods. But five years on, the website has largely pulled out of in-person reporting about violence, instead sourcing its numerous stories about shootings in Chicago neighborhoods from police reports. By doing so, DNAinfo has picked up what has long been a standard practice for violence reporting in the city. As violence has overtaken public discourse in Chicago in recent years, the Tribune and the Sun-Times have tackled the challenge of covering shootings with saturation models that resemble DNAinfo’s, but with varying amounts of in-person reporting involved. In 2015 the Sun-Times started a “Homicide Watch” with an individual story for every gun homicide—the vertical’s motto was that “attention must be paid to each [murder]”—but since then has slipped back into producing mostly wire stories about individual events (“Man, [age], wounded in [neighborhood] shooting”), sourced almost exclusively from police blotters and occasionally expanded with details from the medical examiner’s office. Instead of pumping out an individual story for every shooting, the Tribune, in addition to maintaining its own homicide map, publishes stories that chronicle one night or one weekend’s violence. These stories recount police interviews at crime scenes and conversations had among bystanders and mourners, frequently describing the hardships of life in communities where violence is most prevalent; often, because of the short amount of time the reporters can spend in the neighborhood of the shooting, the period of interest in these stories begins when shots are fired and ends when the crime scene is taken down. The Tribune’s alternative publication RedEye also pursued a homicide tracker and map, which it discontinued in 2015. In “If It Bleeds It Leads,” her article about DNAinfo and violence coverage, Malsky argued that all these blanket models, whether or not they are founded on in-person reporting, are ill-fitted to tackle a crisis like Chicago’s. Instead of reporting on every individual shooting, she suggested more publications ought to “see past the narrative charisma of violence to view it on quieter, more systemic levels.” To the extent that it reached beyond individual shootings, the Times’s Memorial Day coverage reached a familiar set of conclusions: gang violence is caused mostly by a lack of economic opportunity and social support, the dividend of disinvestment from social services in the communities where this violence is now entrenched. Coverage of violence in Chicago’s daily papers sometimes provides these explanations too, often quoting them straight from gang members or relatives of the deceased. But in focusing on the events of a given scene or a given night, this coverage too rarely names the larger forces that lead to violence, and even more rarely traces how they work. It pays lip service to the idea that the city’s gun violence crisis has systemic origins, but still treats this violence as an endless series of random acts. When its usefulness is questioned, publications frequently justify this blanket coverage through an appeal to “raising awareness”: to quote Mary Schmich of the Tribune, “unless people understood…how all of these shootings added together imperil the city, nothing in Chicago would change.” But coverage that only gestures at the conditions that cause violence without articulating what decisions brought those conditions into being—closing mental health clinics, for instance, or closing schools, or scattering public housing residents across the city—will only be of limited use in compelling people to take action. Of course Chicago’s daily newspapers do on occasion produce fuller accounts of the city’s violence, beyond scoreboard and crime scene reporting: the Tribune, for example, recently explored how trauma from violence affects the mental health of the city’s young girls, and took a dive at the end of last year into the life of Tavon Tanner, a ten-year-old who was shot while playing on his porch. The Sun-Times and the Times both produced longer stories about life in the 11th District on the West Side, which housed the largest concentration of shootings last year. There is little doubt that the daily papers would do more in-depth and investigative reporting on violence if they had the resources, but both of their newsrooms have been gutted in recent years, and they are increasingly under-resourced and stretched thin. This meant that the Times, with its well-resourced team of reporters and advanced multimedia platform, was able to devote more attention to the shootings it tracked during Memorial Day weekend than the cash-strapped Chicago papers can possibly devote on a regular basis. But for all this extra oomph, the Memorial Day project did little to advance the conversation around gun violence. The Times “live event,” coming nearly a year after the Memorial Day package, fell short in the same way its coverage did: its assemblage of voices offered no surprises and did little to push the fight against violence forward. 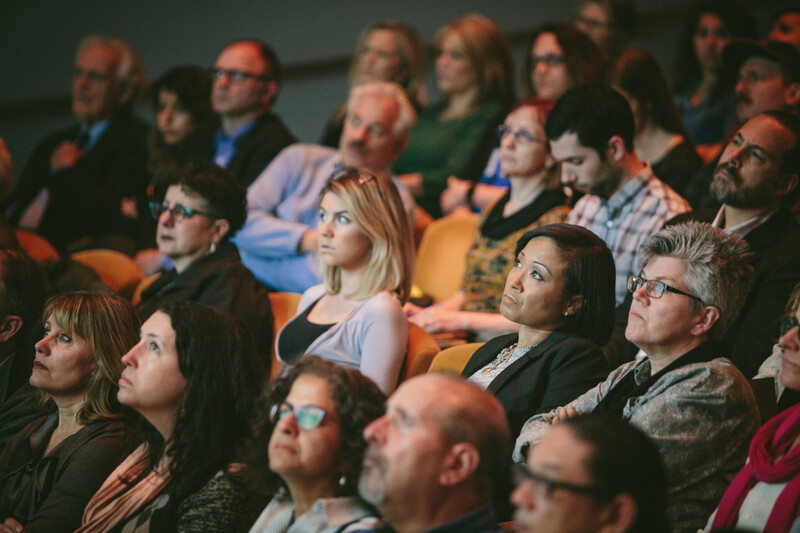 After treating themselves to finger food in the venue lobby, its hundred-or-so well-dressed, mostly white attendees went home no closer to solving the gun violence crisis than they were when they arrived, and the perspectives presented on stage went more or less unchallenged. The first of these perspectives was that of Jens Ludwig, director of the UofC Crime Lab, who started the evening’s discussion after introductory remarks from two high-ranking Times editors. Ludwig, as might be expected of someone who is in charge of something called a “crime lab,” introduced the audience to Chicago’s violence crisis through a quantitative review of patterns in the homicide rate over the past few years, focusing especially on last year’s extreme spike in homicides. Ludwig recently discussed the so-called “Laquan effect,” the idea that fallout from the Laquan McDonald video caused police to make fewer street stops and thereby emboldened criminals, on WBEZ, but he admitted that the Crime Lab has more or less no idea what led to such a sudden increase in gun murders. Using police data to form quantitative analysis of a humanitarian crisis is a practice that can best be described as “insufficient,” but Ludwig’s choice to focus on last year’s spike in violence as a baffling, fascinating anomaly made his talk feel more like a quarterly board meeting than an attempt to solve a humanitarian crisis. He finished by urging the city to try everything necessary to “avoid having another 2016,” saying nothing of the less statistically interesting violence of 2015, 2014, and the years before that. Then he opened the floor to the evening’s three proposed “solutions” to gun violence: law enforcement, social services, and trauma care. The law enforcement panel brought together Kim Foxx, the Cook County state’s attorney; Kenneth Johnson, the CPD commander of District 7 in Englewood; and Sean Malinowski, the deputy chief of the Los Angeles Police Department. Johnson and Malinowski touted the collaboration between LAPD and CPD on new data-driven police strategies, some of which have been piloted in Johnson’s district. Johnson said that the use of a new technology called ShotSpotter, which analyzes shooting scenes to predict where the next shootings will occur and who they will target, had resulted in a sixty percent reduction in shootings in Englewood this February compared to last February. This number has been paraded by CPD as a breakthrough, but had Ludwig still been on stage he might have clarified that statistically it means very little. The number of shootings in a given month can vary widely for many reasons, and it will be impossible to tell if ShotSpotter is truly effective until its impact is measured over multiple years. Foxx was hesitant to call the new technology “fair,” saying that law enforcement was only one part of the solution to the city’s violence. She proceeded to give the night’s only real endorsement of publicly funded social services as a solution for the violence crisis: the city’s most distressed communities, Foxx said, would only be healed by investing in education, employment, and mental health, so that young people no longer have to turn to gangs for guidance and the mentally ill can access full treatment. Foxx’s remarks garnered hearty applause from the audience, unsurprisingly; after all, few people besides Donald Trump and John Kass really believe that law enforcement alone can solve the city’s violence crisis. Johnson and Malinowski also gave nods of agreement but maintained that CPD’s technological innovation provides the best route to a near-term reduction in violence. There was something more than a little ironic about the fact that Foxx said far more about public social services than the panelists on the “Solutions from Social Services” that followed immediately after. The conversation was mostly a back-and-forth between Arne Duncan, the former Chicago Public Schools CEO and U.S. Secretary of Education who is now managing partner at a nonprofit called the Emerson Collective, and Autry Phillips, the executive director of an organization that has led street-level intervention initiatives to curb violence in neighborhoods across the city. Duncan and Phillips agreed that society as a whole has failed the young men who are driving the city’s violence, but differed on the best strategies for helping them: Emerson Collective’s work has sought to turn young adults’ lives around through employment training, while Phillips’s organization seeks to resolve gang disputes through mediation and relationship-building. Neither spoke much about the importance of funding in the areas Foxx mentioned. Duncan, who as CPS CEO experimented with the school closure strategy pursued by his successor Barbara Byrd-Bennett and Mayor Rahm Emanuel in 2013, spent much of his time on stage talking about how to fund and scale the model of the Emerson Collective, which was founded and is largely funded by Laurene Powell Jobs, Steve Jobs’s widow. He later told the Reader’s Maya Dukmasova he thought school closures had had “not much” of an effect on Chicago’s gun violence. The third “social services” panelist, Anuj Shah, assistant professor of behavioral science at UofC’s Booth School of Business and another Crime Lab researcher, only discussed his research on behavioral therapy programs that teach young men to think before they shoot; such therapy is not really “social service,” and Shah seemed out of place on the panel, to put it mildly. His academic angle, combined with Duncan and Phillips’s focus on nonprofits, meant that little time was spent discussing the role of the public sector in mitigating a crisis like Chicago’s, despite Duncan’s experience in government. In the final conversation, Selwyn Rogers, Jr., the director of the forthcoming trauma center at the University of Chicago Medical Center, laid out his plans for a hospital that will engage with surrounding neighborhoods in preventative measures against gun violence in addition to treating actual victims. Rogers seemed conscious that a hospital cannot “solve” a gun violence crisis on its own, but the promise of the trauma center somehow led him to close out the evening by saying he felt optimistic about the fight against Chicago’s gun violence crisis, even as the evening’s previous conversation had underscored just how massive and intractable a problem the city’s violence has proven to be. Thus the event ended with only one panelist having actually made the case for reversing the disinvestment and socioeconomic neglect that has scarred the communities where violence is now most prevalent. Even when disinvestment was discussed as a driving factor in the violence, it was talked about as though it appeared out of nowhere and was not the result of identifiable political decisions. Of course, despite Eligon’s ambitious tweet, the Times organizers did not literally think that a series of panels would bring about an end the city’s gun violence problem. Nevertheless, there was something truly bizarre about the idea that “solving” a dramatic increase in gun violence was a problem that merited a TED-talk-style event in the first place, especially one hosted in a plush auditorium with wine and snacks available afterward. To arrive in a city and host a “provocative” conversation about a humanitarian crisis is perhaps even more insulting than the claim that a multimedia package covering every Memorial Day shooting will “raise awareness” in a way previous local coverage hasn’t. Just as the people who live in the South and West Side communities where violence is entrenched do not need more stories to be written in order to “raise their awareness,” they rarely hesitate to say what forces they believe contribute to gun violence and how this violence can be combated. Yet the event still portrayed violence as a “tide” that has come from nowhere, a plague against which the whole city is united in a fight. The Times’s choice to center police officers and professors at a discussion of that crisis and to have only two Black Chicagoans who are not involved with law enforcement as speakers implied that the people enduring the greatest burden of the city’s violence are somehow not qualified to speak about how it can be solved. I started creating a database of non-school tutor/mentor programs located in Chicago in 1993 and started using GIS maps to show where they were needed, based on poverty, poorly performing schools and violence, in 1994, with the goal of drawing more attention, volunteers and donors directly to the different organizations already operating, and to support people who would create new programs were more were needed. Over the years I’ve presented this strategy to Michelle Obama, when she was at the University of Chicago, Barack Obama, when he was a 1999 speaker at a conference I hosted in Chicago, and to Arne Duncan, about a month before he took over as CEO of Chicago schools. Mayor Daley was a speaker at one of my conferences and my printed newsletters were sent to media, political and business leaders, foundations, hospitals, and many others who need to be strategically involved in filling poverty neighborhoods with hope and opportunity that stays in place for a decade or more. Unfortunately, too few have taken the time to look at what I’ve been sharing or to consider applying the ideas in their own efforts. Thus we’re still talking about a problem today that we were talking about 20 years ago. Over the next few days I’ll post a similar article, pointing to your coverage of last week’s event.